The two latest instalments in the Grudge saga, which already includes a dizzying array of films, TV movies and remakes, arrive now on a single DVD. White Ghost gets off to a cracking start with a pizza delivery guy getting the fright of his life (as did we – the children wondered what we had been shouting about! ), but falls off quite sharply. Black Ghost is made up of longer segments, and has a more coherent narrative, but isn't quite up to the same standard. The ghosts of the first film are exceedingly creepy, though dulled a bit by repetition, while the apparently latex-clad black ghost is much less effective. In both, the jumps back and forth in time usual to a Grudge film mean the mystery is not always whodunnit, but what's the connection, where did it all begin? The only rule is that the victim must have had contact with another person affected by the curse. As a result the films can be rather disjointed and distractingly baffling, but it frees them from the need for a semi-indestructible protagonist – anyone can die, at any time, and that's key to the popularity of the series. These films don't have to play fair. In a new Halloween, you know roughly what kind of scare is coming, and from where on the screen it's likely to come. Here anything can happen anywhere, with sudden, shocking unfairness. If the scares sometimes feel cheap, the terror they inspire is often priceless. That said, the scares are not the only thing here that's cheap: the effects and acting are not always at the level you'd expect from a film. They seem to be shot on video, and I'd guess that these hour-long films were made for TV or released direct to DVD. But if you liked the previous Grudge films, there's much to enjoy here too. This volume, the first of five collecting the complete scientific marvel fiction of Maurice Renard, "the French H.G. Wells", includes a story, "Monsieur Dupont's Vacation", a novel which shares the book's title, and an essay, "Scientific Marvel Fiction and its Effect on the Consciousness of Progress". Monsieur Dupont, a maker of sewing machines and bicycles, receives an invitation from his friend Professor Gambertin to holiday in Les Ormes for a season. Gambertin is an amateur palaeontologist, and caught up in his enthusiasm Dupont spends his holiday digging for dinosaur bones. But what's been nibbling at the bushes? Could one of the dinosaurs have somehow survived? Doctor Lerne is a Moreauvian figure working to graft parts both physical and spiritual from one species to another, from animals to plants, from humans to animals. When a nephew comes to visit it interferes with plans both scientific and romantic, and the outcome can only be tragic. Well, tragic – and rather funny, and quite raunchy. I note without disclosing spoilers that this novel's narrative approach had interesting parallels in the next book I read, Twisthorn Bellow, by Francophile Rhys Hughes. Renard writes extremely well, and there's a sly wit in evidence throughout. There's Flaubertian mockery of the scientific mindset, and Moliere's delight in flim-flam and doubletalk. Though an intellectual writer, he is entertainingly cruel to his characters. As with Brian Stableford's other translations for Black Coat Press there's an exceptionally useful amount of apparatus, making this a very attractive package. For more information on the series see the interview with Stableford in Dark Horizons #56. Doctor Lerne, Subgod, by Maurice Renard, tr. Brian Stableford, Black Coat Press, pb, 328pp. Amazon US . Amazon UK. The Nintendo classic has been remade for XBLA, with hi-res textures and none of the slowdown that reportedly plagued the ambitious original. Joanna Dark is a near future secret agent with a cut-glass English accent whose missions take her into the depths of a conspiracy involving global corporations, warring aliens and artificial intelligences. For those who haven't played the original, the shooting system takes a little getting used to – the trick is to let the intelligent sights find targets on their own – but once you have the hang of it the game becomes a smooth, sleek experience, one that's full of unexpected detail and rich with possibility. On top of the single player levels, which grow in complexity and size as the skill level rises, there are game-changing cheats like slow motion or monkey mode, extra weapons, challenge levels, four-player split screen, online play, co-operative play and counter-operative play. For £6.80, this is ridiculously good value. Perfect Dark, by Rare, for Xbox 360. Sorry to anyone waiting on tenterhooks for the next issue of TQF. As ever I'm having to work around some other commitments, some of them unexpected (I'm looking at you FantasyCon...) but it should be out in a week or two. To launch the forthcoming Silver Age Books publication of "The Arthur Conan Doyle Weirdbook", edited by Rafe McGregor, Oxfam Books and Music Moseley will be hosting a night of Conan Doyle-related terror at the Prince of Wales pub, Alcester Road, Moseley Village, Birmingham, on Saturday 17th July starting at 7.30pm. There will be dramatised readings from the anthologised stories in the new book, some interesting books for sale as well as some even more interesting ones to be won. All proceeds will go to Oxfam, and the only admission fee is that you bring one decent book as a donation to the shop. Moseley's newest and best, and only, bookshop will also be exclusively stocking "The Arthur Conan Doyle Weirdbook" as part of Oxfam's Bookfest. Anita Blake is a lady with a lot of barnacles. She's accumulated many powers in her previous seventeen books, and to a new reader their page-by-page introduction in this one seemed almost ludicrous. Vampire hunter, necromancer, werewolf (sort of) (and were-lots of other things), vampire, another vampire's human servant (and girlfriend), and succubus, she keeps a pet were-leopard and werewolf, and she's a US Marshal. But imagine reading your first Superman comic: okay, this guy can fly. Oh, and he's super-strong, invulnerable, and shoots lasers out of his eyes. Plus, he has super-hearing, and he's a super-ventriloquist, and even a super-kisser! We're so used to Superman that we hardly question it. What matters is how all the powers coalesce into a character. What's interesting about Anita's powers is that none are free: with each comes new dangers, new feelings, and new responsibilities. She's in constant danger of being overwhelmed by them. With great power also comes great difficulty in plotting: how to challenge the hero who has everything? In Flirt we see Superman's worst nightmare: friends targeted by supervillains. Mr Bennington wants his wife back from the dead, and doesn't care who dies to make it happen. With snipers stalking her lovers Anita lets herself be kidnapped by a pair of mercenary were-lions. A were-lion witch cuts her psychic connection with her chums, and things are looking grim. But the bad guys have reckoned without Anita's greatest power of all: her ravenous sexual energy! A few chapters in and this was well on the way to being one of the worst books I'd read in years. The second chapter is dreadful, the banter excruciating as Anita and her gaggle of boyfriends flirt with a waiter and each other in a restaurant. The tone felt familiar - jaunty, forced, creepy - and it took a while to place it: late period Heinlein. Discovering in the afterword that the scene was based on real events made it even worse. What these characters call "playing", other people might well call sexual harassment. But once Anita's love cult is sidelined the book got much, much better. It develops into an interesting sexual thriller, Anita's respectful kidnappers fighting their own desire to mate with her, and pack dynamics play out in human form as she plays them off against each other. Overall, this is a crisp, pointed novel that doesn't outstay its welcome, and if I could forget that indulgent second chapter I'd be happy to read another in the series, preferably one in which Anita is once again separated from her gormless gang of group-huggers. Also published this week: the 19th Anita Blake novel, Bullet, in which Anita must face the Mother of All Darkness, who is after her body... Though not for the reason everyone else is. Roz Goddard and Michael Wyndham Thomas (author of The Mercury Annual) are inviting everyone to the launch of their new poetry collections: The Sopranos Sonnets & Other Poems, and Port Winston Mulberry. The event is on Thursday 15th July from 7.30pm - 9.00pm, at The Priory Rooms, Bull Street, Birmingham, B4 6AF. Entry is free. "Join us to celebrate the Launch of two brand new poetry collections from Nine Arches Press and Littlejohn & Bray, with readings from Roz Goddard and Michael Wyndham Thomas. This pamphlet will be available as a standard pamphlet, but also as a signed limited-edition pamphlet in a print run of 100 copies only. Mulberries was the name of the artificial harbours used for the D-Day landings in June, 1944. The title poem of the collection, Port Winston Mulberry highlights one of Michael Wyndham Thomas's abiding interests: giving voice to anonymous witnesses when history throws a fit. But this is just one strand in his latest collection. Reflections on how relationships are (or ought to be); observations of the passing human scene; the light and shade of memory; even commemorations of a father's lethal choice of van – all of these and more find voice in a collection as varied in mood and form as in subject. 'My dad drove vans,' declares the opening poem. Michael Wyndham Thomas drives in all directions and returns with much to report." If you're not already a member of the British Fantasy Society, I'm afraid you've almost certainly left it too late to get your hands on either of these: a last minute upswing in membership left the print orders looking a bit pessimistic! Prism (right) features the editor's report on the World Horror Convention, along with dozens of reviews, an interview with Shaun Jeffrey, columns by John L. Probert, Ramsey Campbell and Mark Morris, and without a doubt the finest, most lovingly crafted Chairman's Chat the British Fantasy Society has ever seen. Edited by David A. Riley. 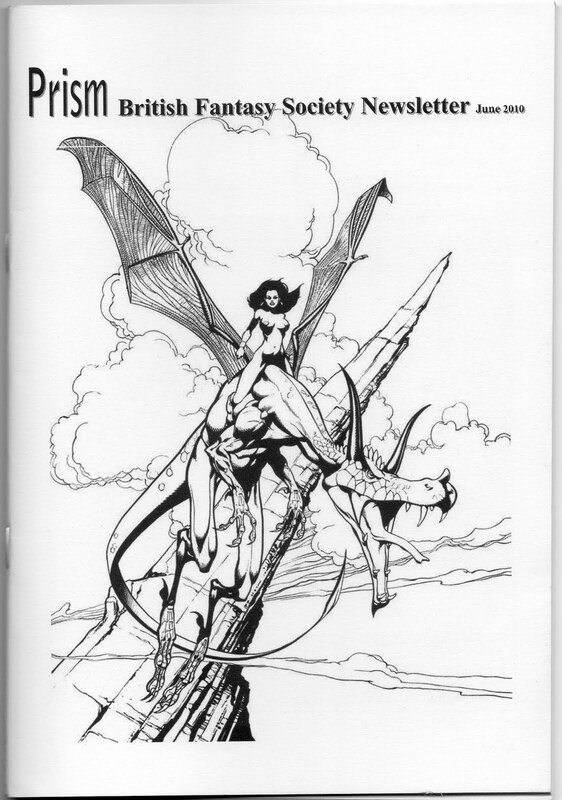 Cover art by Howard Molloy. New Horizons issue five, edited by former Elastic Press supremo Andrew Hook, features stories by Craig Hallam, Frank Roger, Terry Grimwood, Mark Finnemore, Allen Ashley and Douglas Thompson, and a series of bite-sized interviews by Andrew with literary luminaries at the World Horror Convention 2010, including Neil Gaiman, Ian Watson and Paul Cornell. The fantastic cover art (see left) is by George Cotronis. Like Kirth Gersen, hero of Jack Vance's Demon Princes quintet, Kerryl Ryson loses his family in tragic circumstances and swears vengeance on all those responsible. As a boy he lives on the rural world of Stohlson’s Redemption, where domesticated dinosaurs fill every role from elephant to shire horse to cow, but a prologue tells us he will end up in the power of "the twelve Palatines who comprised the Colloquy of the Duze Majestrals", trapped in the central fastness of their Crystal Tower, "hemmed in on all sides by determined and ferocious leperons, totally immobilized by neuronic grapples". How did he get there, and why are they so afraid of him? Dinosaur Park begins as a pastiche of Jack Vance, but Vance's natural mode is to view his characters and the worlds they visit with such arch irony that the parodic aspect of this book is quickly subsumed into pure emulation of Vance's style. On its initial publication (as The Thirteenth Majestral) it attracted praise from Vance himself, and I can hardly disagree. The conclusion here is perhaps not as violently satisfying as those of its inspirations, but Peirce maintains an enjoyable detachment from his protagonist, leaving the reader to consider that his cause – and his actions – aren't always as justified as he thinks. The worst thing I can find to say about this quirky, elegant and highly diverting novel is that it left me looking in vain for another new book in my collection so finely attuned to my particular tastes. I have a big blue box under my desk, and when a book, DVD or CD comes in for review I put it in the box. What's in my blue box today? 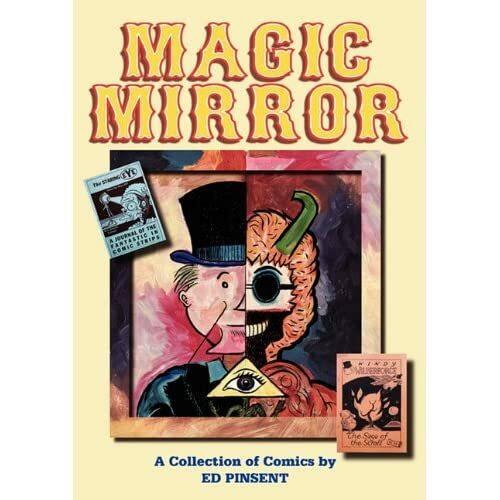 Just today I received a very attractive collection of indie comics, Magic Mirror, by Ed Pinsent. It's from Eibonvale Press, who previously published Ultrameta by Douglas Thompson, The Oz Suite by Gerard Houarner and the BFA-nominated Once & Future Cities by Allen Ashley, among others. I can't wait to start reading this. They seem to be a company that's really going places. Today was a good day, because it also brought me a screener of Kaiji: the Ultimate Gambler, for review for the British Fantasy Society's news magazine, Prism (though the review will turn up on here too). It looks very interesting. Out on 26 July 2010 from 4Digital Media, it reunites the cast of Death Note (which I have to admit is still sitting on my V+ box). 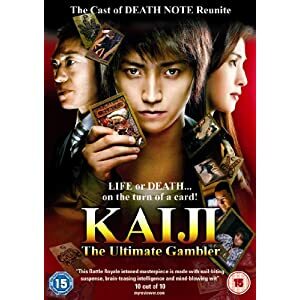 Kaiji is a young rogue who has to choose between spending ten years paying off his gambling debts, or one night on board a mysterious gambling boat. Does he get a sensible job in an office and pay off his debts, or does he risk everything on the most dangerous night of his life? I won't know until I've watched the movie, but I suspect I know the answer. 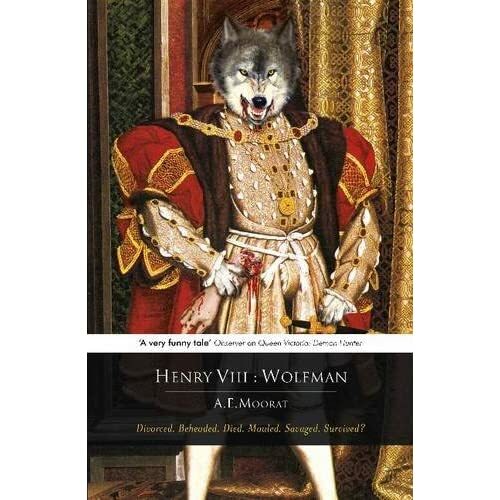 Henry VIII: Wolfman is the follow-up to the same author's Queen Victoria: Demon Hunter, which I enjoyed without really loving. Like its predecessor it features a great cover image and a snappy tagline, but QV:DH (as fans might call it) left some interesting characters in the air, and I'm a little disappointed that instead this is a prequel (if indeed it's part of the same continuity). On the other hand, I haven't read a book like this set in this period, so that might give it a bit of interest. 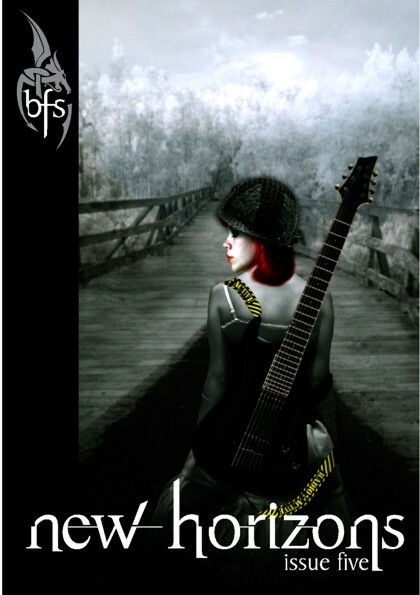 Flirt and Bullet by Laurel K. Hamilton came in for review via Dark Horizons, and so any reviews of them will end up appearing on the British Fantasy Society website, possibly in Prism if they don't already have a review. 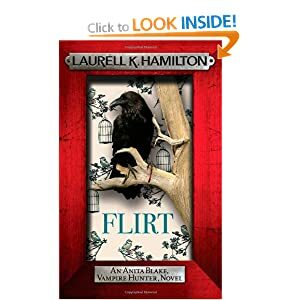 I do hope Laurell K. Hamilton fans aren't the vindictive types, because so far I'm not enjoying Flirt at all. Both books have great covers, though. Jean Marsh and Peter Purves take it in turns to read chapters of this, the second of John Peel's novelisations of The Daleks' Master Plan, a twelve-part serial from the later period of William Hartnell's time as the Doctor. With space spy Sara Kingdom and space pilot Steven Taylor he absent-mindedly battles the daleks and their allies across time and space, from ancient Egypt to the year 4000, with flying visits to a police station, a cricket match and a Hollywood film set. The Chase, the previous dalek story, had been rather long and silly, and it seems at times as if the goal with this one was to make it even longer and sillier. If a modern-day dalek story took a detour into a cream-pie fight, I imagine many fans would simply explode at their keyboards! Jean Marsh gives her reading a gravitas that the bulk of the story doesn't quite deserve – though how do you approach a reading that begins with your character asking questions about the dangers of fish and chips and ends with her tragic death? – while Peter Purves' reading is perhaps a bit too neutral at times, reminding me of the linking narrations he provides on the Doctor Who radio collection CDs. But silly isn't necessarily bad: I had great fun listening to this set, and it had an epic scope few Doctor Who stories share. These five CDs will often find their way back into my stereo. John Peel's novelisation adds much to our limited understanding of Kingdom's character and motivation, and in the dalek scenes you get a real sense of how frustrating and baffling it is for them to be repeatedly defeated by this strange old wanderer. This story is 45 years old, but the Doctor's the same man we see on television today, throwing himself into ridiculously dangerous situations with little more than wits and luck to get him through, and giving the bad guys every possible chance to do the right thing. Doctor Who, Daleks: The Mutation of Time. By John Peel, read by Peter Purves and Jean Marsh, with dalek voices by Nicholas Briggs. BBC Audio, 5xCD, 5hrs50. In his introduction Mark Valentine describes the inspiration for these 23 stories as those of Prince Zaleski, Mr Dyson and Carnacki. I've only met the last of those gentlemen, but these stories are not at all shamed to be mentioned in the same breath. Yet where Carnacki is immensely practical, an almost scientific investigator of the paranormal, The Connoisseur rather experiences events, or provides an understanding of them. The clue's in the name: he is a connoisseur of the weird, as well as the lovely. Occasionally he gives events a nudge towards a conclusion, but more often he's there simply to witness the moments of sadness or glory or terror offered by his mysterious world. One other thing that sets these stories apart from Carnacki, and gives the book a territory wholly its own (at least in my limited experience of the genre) is their focus on the arts; literature, sculpture, architecture, poetry, music, woodcarving and metalwork all give rise to fascinating mysteries. The stories are generally very short, leaving the reader with a chocolate box dilemma – wolf them all down, or force oneself to save some for later? I'd recommend wolfing them down, since unlike chocolates you can return to a book a second time, and the flawless writing here deserves a second, careful reading, free from the consideration of what-happens-next. Very much recommended. The Collected Connoisseur, Mark Valentine and John Howard, Tartarus Press, pb, 306pp. Nominated for the British Fantasy Award for Best Magazine! Theaker's Quarterly Fiction has somehow sneaked on to the shortlist for the British Fantasy Awards. Since I'm currently the administrator of those awards it's a little embarrassing, so a pox on everyone who voted for us! I'm won't pretend there aren't magazines out there who might have been expected to earn the slot ahead of us. For example the longlist featured brilliant publications like Weird Tales, Lady Churchill's Rosebud Wristlet, Clarkesworld Magazine, Dodgem Logic, Estronomicon and Fantasy Magazine. So there's a bit of luck in it, and perhaps a bit of gratitude for the work I've done for the BFS, but I'll take it! We did publish some marvellous material last year. The other nominees are Black Static, Cemetery Dance, Interzone, Midnight Street and Murky Depths. Postscripts won the 2009 award, but competed this year as an anthology instead, so it's wide open. Good luck to everyone! Especially us! Nina Wilde, all-action archaeologist, has put away her pony-tail following the pyrrhic conclusion of a previous adventure and languishes in professional disgrace. Her ex-SAS husband Eddie Chase, a balding Yorkshireman with a weak line in post-kill puns, makes ends meet as a bodyguard to the stars. Things are slow, but soon they'll run into Macy Sharif, "a broomstick with two watermelons taped to it". She knows the secret of the Sphinx and the evil international cult of Osiris is after her. What to say about a book that features a thirty-page car chase through central New York? If that doesn't sound good, this isn't the book for you! This is an action movie in paper form, more National Treasure than the Da Vinci Code, and it delivers on its promise. McDermott's very good keeping things moving while keeping them clear, always a tough balance to strike in describing action sequences. The fantasy elements are minor, so in that sense it may not be of huge interest to BFS members (for whom this review was originally written), and it's not challenging, or deep, or original, but unlike its vicious but incompetent bad guys it hits nearly all its targets. The banter is rather clunky and centres too often on Macy's breasts, but the book is fast-moving, hopping from New York to Giza in the turn of a page, tremendously exciting, and satisfyingly brutal to its villains. It wears its influences on its sleeves, with Bond, Lara Croft and Indiana Jones all getting namechecks, and is in general rather sweet-natured: the leads are very much in love, and, just like in The A-Team, innocents usually get time to crawl to safety before anything explodes. And lots of things explode: McDermott uses every dollar of a book's unlimited budget for pyrotechnics. The book ends with a thirty-page preview of the next in the series, which promises more of the same. The Cult of Osiris, Andy McDermott, Headline, pb, 500pp.